I am not currently accepting new Intuitive Counsel clients. If you are a current client who would like to book, please contact me here. Is everything just kind of fucked up? Does your intuition feel trapped, and you’re running in circles trying to figure out your next steps? Do you have questions with no answers, or too many answers and no way to decide? Does your life look practically perfect, and yet you feel more lost than ever? If you're ready to shift out of these questions and reconnect to your path, Intuitive Counsel sessions are a channeled offering drawing the clarity of the tarot to help you find your way forward. In a 60 minute one-on-one session, we will meld counseling with magic making, calling upon the knowledge of the wider world to guide your steps into the future. The session will build upon your needs and goals, and may address your physical, emotional, and spiritual states with suggestions for further action, herbal and energetic remedies, and more. You will be asked to be honest and willing to see the truth of your situation so that we can weave the past and present together to create your future. The cards will guide us, showing possible outcomes and the information you most need to know at this time. We will laugh, probably curse, and speak frankly about the choices that frame your journey. After our session you will be centered, secure, and ready to move forward with the full support of the universe. To prepare for our time together, please consider what questions you have and what areas of your life want attention. The more you are able to share, the deeper I will be able to dive into the cards and my channel to serve you. Offered via phone/Zoom Video. House calls available upon request for an additional fee. $150 for a 60-minute session or $85 for a 30-minute session. 30-minute sessions are recommended if you have one or two specific questions. Tips are appreciated but certainly not required, and are a way for those with more resources to defray the cost of sliding scale sessions for others. Sliding scale sessions are available for folks experiencing financial hardship. Please contact me here if the cost of this session is prohibitive and you feel called to work with me. 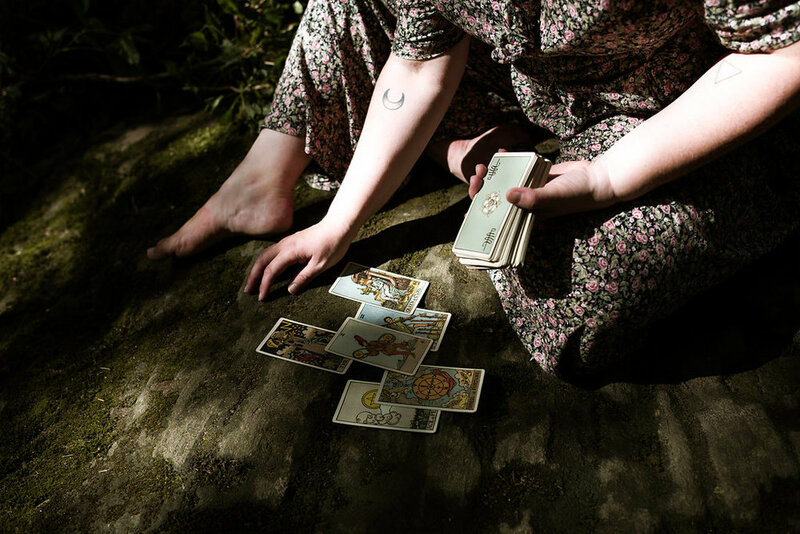 Want to learn to read tarot for yourself? Get the Free Tarot Ebook. N.B. I am not a doctor, a therapist, or a licensed professional anything. I am a sober human who has studied tarot and herbalism, has a useless degree in French and Molecular Cell Biology, and has talked with a lot of folks about their lives and dreams and fears. Readings are for entertainment purposes only, and if you are in need of medical or psychiatric care I will refer you to those modalities.